Earthquake Report is looking for volunteer Seismologists and amateur Earthquake Watchers. Like to join, e-mail us. Depending on the data source 38 to 60 km depth. Out in the sea and about 30 km from Kinkasan Island and Oshika Peninsula. Looks moderately powerful, but due to the depth will have been hardly felt. Although the quake occurred under land at only 45 km from La Romana and Juan Dolio areas, a region full with holiday resorts. This earthquake list covers minor and major earthquakes in the world. If a more detailed page is present, the earthquake line will be linked to the detailed page. The page is regularly updated to add new earthquakes. QuakeSOS is a FREE iPhone application developed by Armand Vervaeck, the creator and main contributor to Earthquake Report. The Application simplifies immediate group communication to friends and family members (with your exact GPS location) and is constantly feeding the users with “Earthquake Report” news. Together with your own family and friends, QuakeSOS will be your closest earthquake friend. This year’s scenario was a 8.7- magnitude earthquake which struck out of the coast of western Wakayama Prefecture and simultaneously triggered two similarly powerful quakes along the coast. The government had an emergency meeting at the office of the prime minister, who called upon the public to act in calm. Prime Minister Naoto Kan went to a drill in Ito (Shizuoka Prefecture) where he helped carry sandbags. Hundreds of local people gathered in the hot spring resort city to learn skills as how to put out fires, set up temporary toilets, and help the injured on the assumption that the city was hit by a huge tsunami. People were able to experience the earthquake in a specially build vehicle. 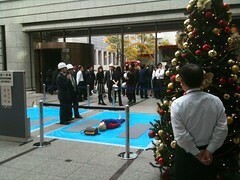 Drills were also organized in many other towns including Tokyo. A total of 670,000 people joined in the quake relief drills. Japan execises earthquake simulations around the country to commemorate the 7.9-magnitude Great Kanto Earthquake on Sept. 1, 1923. The disaster killed an estimated 143,000 people in Tokyo and other areas. U.S. military forces based in Japan cooperated with Japanese officials in a major earthquake disaster response exercise here Sept. 1. U.S. forces used the experience to test processes and communication links that would be used in the event of an actual crisis. U.S. Naval Forces Japan provided the USS Gary to transport Japanese citizens from Tokyo Bay to Yokosuka Naval Base, the frigate’s homeport, similar to noncombatant evacuation operations. NEOs evacuate civilian personnel who may be at risk due to events such as regional hostilities or natural disasters. Equipped with a 50 kilowatt radio transmission tower, American Forces Network-Tokyo aired emergency announcements from Yokota so U.S. citizens residing in the Tokyo area — U.S government employees, business people, students and tourists — could receive instructions and updates in English. The network’s principal audience is the roughly 300,000 U.S. military members, civilian employees, and family members stationed throughout Japan. U.S. forces have a strong disaster response record in the region. Yokota Air Base Airmen delivered 18,000 pounds of supplies to Japanese response teams after an earthquake in Niigata Prefecture in 2004, and U.S. servicemembers delivered almost 5,000 tons of relief supplies and treated more than 2,200 patients in Southeast Asia after the devastating tsunami the same year. This year marks the most extensive level of U.S. participation in the drill. 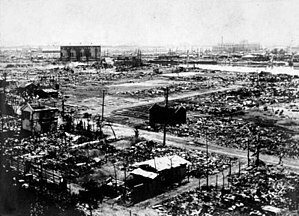 The 1923 Great Kantō earthquake struck the Kantō plain on the Japanese main island of Honshū at 11:58:44 am JST on September 1, 1923. Varied accounts hold that the duration of the earthquake was between 4 and 10 minutes. The quake had a magnitude of 7.9 on the Richter scale, with its focus deep beneath Izu Ōshima Island in Sagami Bay. This earthquake devastated Tokyo, the port city of Yokohama, surrounding prefectures of Chiba, Kanagawa, and Shizuoka, and caused widespread damage throughout the Kantō region. The power and intensity of the earthquake is easy to underestimate, but it managed to move the 93-ton Great Buddha statue at Kamakura which was over 60 km away from the epicenter. The statue slid forward almost two feet. According to the Japanese construction company Kajima Kobori Research’s report of September 2005, there were 105,000 confirmed deaths in the 1923 quake. Because the earthquake struck at lunchtime when many people were using fire to cook food, the damage and the number of fatalities were augmented due to fires which broke out in numerous locations. The fires spread rapidly due to high winds from a nearby typhoon off the coast of Noto Peninsula in Northern Japan and some developed into firestorms which swept across cities. This caused many to die when their feet got stuck in melting tarmac; however, the single greatest loss of life occurred when approximately 38,000 people packed into an open space at the Rikugun Honjo Hifukusho (Former Army Clothing Depot) in downtown Tokyo were incinerated by a firestorm-induced fire whirl. As the earthquake had caused water mains to break, putting out the fires took nearly two full days until late in the morning of September 3. The fires were the biggest causes of death. The Imperial Palace caught fire, but the Prince Regent was unharmed. The Emperor and Empress were at Nikko when the earthquake struck the city, and were never in any danger. Cases of homes being buried or swept away by landslides were particularly frequent in the mountainous areas and hilly coastal areas in western Kanagawa Prefecture. These cases are reported to account for the deaths of about 800 people. At the railway station in the village of Nebukawa, west of Odawara, a collapsing mountainside pushed a passing passenger train with over 100 passengers downhill into the sea along with the entire station structure and the village itself. A tsunami reached the coast within minutes in some areas, hitting the coast of Sagami Bay, Boso Peninsula, Izu Islands and the east coast of Izu Peninsula. Tsunamis of up to 10 meters were recorded. Examples of tsunami damage include about 100 people killed along Yui-ga-hama beach in Kamakura and an estimated 50 people on the Enoshima causeway. Over 570,000 homes were destroyed, leaving an estimated 1.9 million homeless. Some evacuees were transported by ship to as far from Kanto as the port of Kobe in Kansai. The damage is estimated to have exceeded one billion U.S. dollars at contemporary values. There were 57 accountable aftershocks. At around the time of the earthquake, a strong typhoon struck the Tokyo Bay area. Some scientists, including C.F. Brooks of the United States Weather Bureau hypothesise that the conflicting forces exerted by a sudden decrease of atmospheric pressure coupled with a sudden increase of pressure from the sea caused by storm surge on an already-stressed earthquake fault may have been enough to trigger the initial quake. Altogether, the earthquake and typhoon killed an estimated 99,300 people, and another 43,500 went missing. The 1962 Bou’in-Zahra earthquake occurred on September 1, 1962, in the settlement of Bou’in-Zahra, Qazvin Province, Iran. 12,225 fatalities resulted from the massive, magnitude 6.9 earthquake. 12,225 fatalities resulted from the earthquake. An additional 2,776 people were injured; along with 21,310 houses either destroyed or too damaged to repair. 35 percent of domestic livestock was also killed, and several landslides and rock falls occurred posterior to the rupture. 21,000 houses were destroyed, mainly because they were made up of mud and brick. Over 7,500 were buried in 31 individual villages, followed by reports from 60 additional villages. In these villages, however, 26,618 survived. One hospital in Tehran was “packed” with over 2,500 victims. Slight damage was experienced in Tehran, the nation’s capital. Cities as far away as Tabriz, Esfahan and Yazd reported the tremor. Sandblows also formed along the rupture zone. The earthquake was also declared the largest rupture in the region since approximately 1630, over 300 years prior. Earthquake lights were also sighted from the Rudak area multiple times. Qazvin Province lies in an area of Iran that experiences large earthquakes. The 1962 event originated on one of many faults in the area, called the Ipak Fault. Believed to have been reactivated multiple times, the fault is extensive and could still pose a threat to locals. Iran’s building codes, renowned for performing poorly during earthquakes, were recently evaluated by multiple world organizations. Most hope that the Iranian government will implement a better quality of design, highlighting that Iran is among the most seismically active countries in the world. Strong aftershock of the Dasht-e Bayaz and Ferdows earthquake (August 31) (see August 31), destroying an additional 175 villages, killing a lot of people and livestock. Three people killed and 13 injured at the Vaal Reefs gold mine. “In memory of” is highlighting deadly earthquakes of the past. People have forgotten a lot of these human tragedies. We @ Earthquake Report are hopeful that people in these countries and cities will learn from their history and will make sure that they are building Earthquake Proof houses and that they know what to do when the earth will be shaking again. Try us on twitter and be one of the best informed people on earthquakes in the world. Kliuchevskoi is Kamchatka’s (Russia) highest and most active volcano. 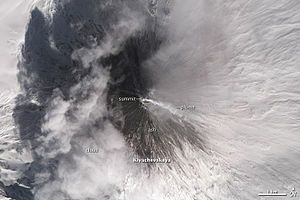 The Kliuchevskoi volcano is reported as being active today. Since its origin about 6000 years ago, the beautifully symmetrical, 4835-m-high basaltic stratovolcano has produced frequent moderate-volume explosive and effusive eruptions without major periods of inactivity. Kliuchevskoi rises above a saddle NE of sharp-peaked Kamen volcano and lies SE of the broad Ushkovsky massif. More than 100 flank eruptions have occurred at Kliuchevskoi during the past roughly 3000 years, with most lateral craters and cones occurring along radial fissures between the unconfined NE-to-SE flanks of the conical volcano between 500 m and 3600 m elevation. The morphology of its 700-m-wide summit crater has been frequently modified by historical eruptions, which have been recorded since the late-17th century. Historical eruptions have originated primarily from the summit crater, but have also included numerous major explosive and effusive eruptions from flank craters. The Kamchatka Peninsula is the northern link in the 2000 km Kuril-Kamchatka island arc. This region contains 68 active volcanoes, over 10 percent of the total found on land anywhere on Earth. This arc is part of the “Ring of Fire,” a string of volcanoes that encircles the Pacific Ocean. Kliuchevskoi volcano is the product of the subduction of the Pacific plate under the Okhotsk plate. In Focus on an active volcano, today : … earthquake-report.com will put the spotlight on volcanoes who are sometimes not known to the broad public, but are jewels on the crown of our planet. Some of them are active for hundred’s of years without sleeping, but are not well known because they are located in unpopulated area’s. Enjoy the details and the beauty of these beautiful mountains of fire !